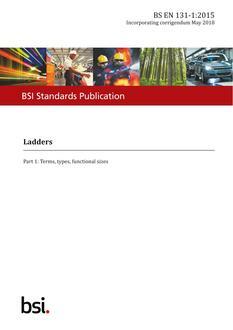 BS EN 131-1:2015 defines terms and specifies the general design characteristics of ladders. It applies to portable ladders. It does not apply to ladders designed for specific professional use such as fire brigade ladders, roof ladders and mobile ladders. NOTE 1 For multiple hinge joint ladders EN 131-4 applies. NOTE 2 For telescopic ladders EN 131-6 applies. NOTE 3 For mobile ladders with platforms EN 131-7 applies.